How to prevent bed bug bites...that's front and center in the mind of anyone dealing with the irritating little critters. Here are three strategies that work - and a few important warnings. While you may not be able to get rid of bed bug bites all together, there are certainly things you can do to reduce how often these buggers make a meal of you. Reducing your bed bug infestation is the most obvious way to prevent bed bug bites, even if it's not the easiest. The more bed bugs you can get rid of (or contain), the more you will prevent the bites. It's simple math. Use the IPM (Integrated pest management) techniques laid out in the bed bug control section of this site. Follow the plan laid out by your exterminator. Or if you are going the DIY route (not recommended unless you have no choice), create your best IPM action plan using our step-by-step tutorial. All of the suggestions below are only effective as part of a coordinated plan to eliminate the bed bug infestation in your home. Regardless of whether you are working with an exterminator or not, the single best thing you can do to prevent bed bug bites is to protect your bed. Encase your mattress, pillows and box spring in a good quality mattress encasement that is designed for bed bugs. The encasements trap the bedbugs that are living there and prevents them from biting you. It also makes it easy to spot (and kill) the ones that show up from other hiding places. Obviously, that also helps you accomplish bed bug bite prevention tactic #1 above. Nice how that works, right? Also, use bed bug detectors/traps like the climb-up interceptors to catch ‘em on the way up to the bed and on the way down. These won't eliminate your bed bug infestation on their own, but they will help protect you from being bitten. Bed bugs typically bite on exposed skin, so wear pajamas with long pants and long sleeves if at all possible. Even if its late July and the heat index is 100. Crank up the A/C if necessary! 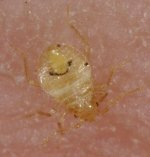 The middle of a full-fledged bed bug infestation is not the time to be sleeping in your skivvies, or worse yet, your birthday suit! Sleep under the covers and tuck them in tight. (Maybe that's where the old saying “sleep tight, don’t let the bed bugs bite” came from?) Again, bed bugs have difficulty biting through fabric and are looking for exposed skin. So not giving them any skin to feast on is a solid strategy to prevent bed bug bites. Note: This will really only work if you have properly protected the bed with mattress and box spring encasements. Many people’s first instinct is to move to another room to avoid getting bitten. BAD IDEA. They will follow you and you will just spread the infestation to other parts of the house. Bed Bugs are attracted to the heat of our bodies and the carbon dioxide we exhale, so they can find you - and they will - no matter where you go to try to avoid them. Some people have recommended using a number of essential oils as a natural bed bug repellents. They may be a safer option and may work at preventing bed bug bites in the short-term. But again, that's not really going to solve your problem. Notwithstanding the health and safety concerns, repellents are just going to drive bed bugs further into their hiding places - and they can live there for up to 18 months without a blood meal - so in reality, you are not really preventing bed bug bites. You are just prolonging your agony. 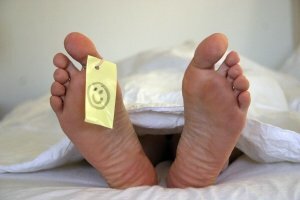 If you want to get rid bed bugs, you're going to have to draw them out and so they can meet their death on their way to you. Unfortunately, that means you are the bait. If you're using residual spray insecticides or bed bug dust (DE) they have to come in contact with it for it to kill them. The bottom line is this... in most cases you are going to have to endure at least some bites for at least a little while to effectively get rid of the bed bugs. The trick is to make it as few bites as possible, for little time as possible. There’s no doubt about it – bed bug bites are a pain! So to ease your mind (and soothe your itch), here are some treatment tips for making your bed bug bites a little more bearable.